Good morning! Today we will start working with Google Earth Engine. Rest of the afternoon Do/finalise the exercise. If you do not have an activated account yet, register an account now and hopefully your account will be activated soon. If it doesn't work out, ask someone to share a repository with you, that should grant you an account. The platform for global analysis is there, but it needs specialists, students and researchers like you, to use the Earth Engine platform to do high-impact data-driven science. What does Google Earth Engine do? Datasets: A petabyte-scale archive of publicly available remotely sensed imagery (such as Landsat, Sentinel and Modis) and other data (e.g. elevation data). Explore categories of data in the archive or browse and search datasets. Compute power: Googleâs computational infrastructure optimized for parallel processing of geospatial data. Learn more from Gorelick et al. (2017). Today you will learn about Google Earth Engine by going through 9 tutorials made by Google. In the morning you will work on these tutorials. Have fun working in the cloud! Google Earth Engine is a nice platform for processing and visualization. Even though raw data can be downloaded, such an attempt would defeat its intended goal of uploading the code next to the data instead of downloading data next to the code. Question 1: Is the code on the online editor reproducible for other users? If you finished these tutorials and want to do more advanced stuff with the Code Editor you can have a look at other tutorials made by universities or at more advanced guides of Earth Engine (you can find the guides in the left pane) about the Image (e.g. gradients, edge detection, object detection), ImageCollection, Geometry & Features, Reducer, Join, Chart (e.g. time series analysis), Array, User Interfaces, Specialized Algorithms, Asset Management, Custom Applications and Earth Engine setup. This presentation on the Earth Engine user summit explains more about the Python API. python -c "import ee; ee.Initialize()"
After setting up the Python environment, you can start a jupyter notebook or spyder and run some Python code. # Initialize the Earth Engine object, using the authentication credentials. # Print the information for an image asset. 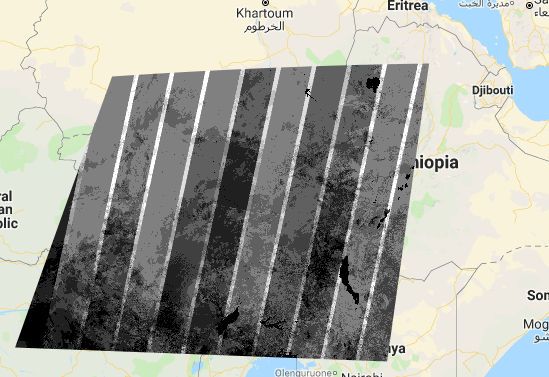 Now we want a Python script that shows a time series of Landsat 8 imagery. To explain what is going on in the script: an ImageCollection is created and queried by filtering on date, location, clouds, bands. The ImageCollection object holds the information of the query and is sent to the Google Earth Engine server. The Google Earth Engine server then performs the task of gathering the data, making the imagery into a video and then exporting it to your Google Drive. There are some more advanced Python scripts made by the Google Earth Engine developers that work with bqplot and ipyleaflet. If you want you can have a look at those too. In remote sensing clouds are our arch enemies. You probably heard this a lot, and you'll hear it again from everyone working with satellite imagery. But how big of a problem are clouds, cloud shadows, or other obstructions? Are they as bad as people say? Have fun figuring it out using the online code editor of Google Earth Engine. Create a new file in that repository and name it Assignment13. At the beginning of this file write your names as comments. It is really important to Get familiar with the Geometry tools of the Code Editor, in order to be able to choose a geometry of interest. The code editor is powerful because you can visualize images immediately on the Map section. It is important to think what Image Collections and bands you need to filter on your dates. The quality mask is stored in the pixel_qa band as a bitmask. You can use the Landsat 8 Surface Reflectance Code Product Guide to remap the clear pixel_qa values to 1. 386 is a good value for clear observations. Question 2: Can you find a better value for clear observations than 386, could you use these together? -Are there any interesting patterns on the total number of observations? Can you explain all these patterns? The answer to this question on StackExchange might come in handy. You should probably first count all valid observations and then mask your way through each band towards the total number of clear observations. Do the same for sentinel 2. Plot the map in parallel linked panels. Still have some time left? Work on the visualization parameters. Further you can explore how you can use Google Earth Engine for your project or try to do some of the more advanced guides(scroll through the left pane). Sunny places make good holidays. After all this work, you can use the map you just created to search for your next holiday destination, while listening to an Irving Berlin classic. Most of the information on Google Earth Engine in this tutorial comes directly from Google and from universities, whom developed tutorials for students to work with Google Earth Engine.